A recent report published by Infinium Global Research on industrial steam turbines market provides in-depth analysis of segments and sub-segments in the global as well as regional industrial steam turbines market. The study also highlights the impact of drivers, restraints, and macro indicators on the global and regional industrial steam turbines market over the short term as well as long term. The report is a comprehensive presentation of trends, forecast and dollar values of global industrial steam turbines market. According to the report, the global industrial steam turbines market is projected to grow at a CAGR of 4.40% over the forecast period of 2018-2024. Steam turbines is a mechanical device that extracts thermal energy from pressurized steam and generates electrical energy. Industrial steam turbine is a steam-driven driver. The most common use of industrial steam turbines is to produce electricity in the thermal power plants. For power generation, industrial steam turbines such as extraction-condensing turbines, extraction back-pressure turbines, and geared turbines are used in industrial plants. Industrial steam turbines have numerous features including higher efficiency, easier maintenance, smaller initial investment, and smaller space requirements. 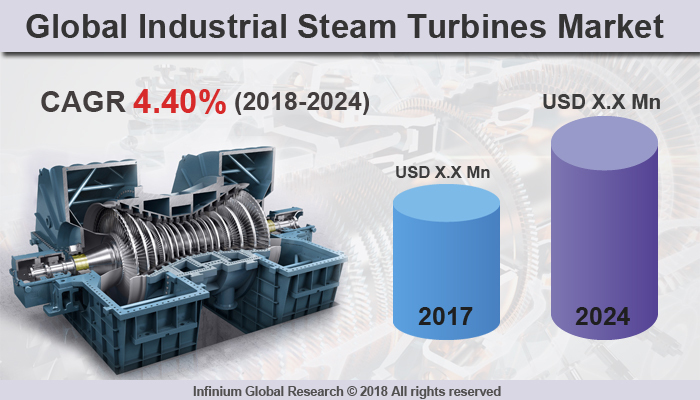 The growing demand for industrial steam turbines owing to increasing electricity requirement across the globe is the key driver for the growth of industrial stream turbines market. Moreover, rapid industrialization, urbanization, growing government initiatives to generate electricity, and expanding infrastructure developments are some factors that influence the growth of industrial steam turbines market. Moreover, rapid growth of nuclear-based power plants and high set-up cost of nuclear power plants over the globe are escalating the demand for industrial steam turbines market. The growing requirement of industrial steam turbines from chemical industry, Oil & Gas and sugar mills are fuelling the growth of this market. However, increasing inclination towards gas turbines in power generating units restrains the growth of industrial steam turbines market. Going further, advancements in industrial steam turbines and expansion of construction industry, growing installation of thermal power generation units and growing popularity of dual-purpose industrial steam turbines are anticipated to create fruitful opportunities for the industrial steam turbines market during the forecast period. Among the region, Asia Pacific has the maximum market share in industrial steam turbines market. The factors such as rapid industrialization and urbanization and expanding requirement of electricity are responsible for growth of the industrial steam turbines market in this region. Europe region is anticipated to have a significant revenue share in industrial steam turbines market. In North America, the growth in the renewable energy sector drives the industrial steam turbines market. In the United States alone around 85.0% of the electricity is produced using steam turbine generators. The Middle East and Africa region are anticipated to grow at a steady rate in the industrial stream turbines market during forecast period owing to the increasing infrastructural development in this region. The report on global industrial steam turbines market covers segments such as type, rated capacity, and end user. On the basis of type, the sub-markets include combined cycle and cogeneration. On the basis of rated capacity, the sub-markets include less than 125 mw, 125-300 mw, 300-550 mw, 550-750 mw, and more than 750mw. On the basis of end user, the sub-markets include industrial, utility, and power. The report provides regional analysis covering geographies such as North America, Europe, Asia-Pacific, and Rest of the World. In this section, the key trends and market size for each geography are provided over the period of 2016-2024. The countries covered in the North America region include the U.S., Canada, and Mexico while Asia-Pacific includes China, Japan, India, South Korea, Malaysia, and among others. Moreover, Germany, U.K., France, Spain, and Rest of Europe are included in the European region. The U.S. drives the growth in the North America region as it is the largest market in this region. The Asia-pacific region offers a substantial potential for the market growth owing to rapid growth in markets such as India and China. The report provides profiles of the companies in the market such as MITSUBISHI HEAVY INDUSTRIES, LTD., Elliott Group, Harbin Electric Machinery Co., Ltd., GENERAL ELECTRIC, Dongfang Electric Corporation, Fuji Electric Co., Ltd., Power Machines, Ansaldo Energia, Doosan Škoda Power, Kawasaki Heavy Industries Ltd., Peter Brotherhood Ltd., and Siemens AG. The report provides deep insights into the demand forecasts, market trends, and micro and macro indicators. In addition, this report provides insights into the factors that are driving and restraining the growth in this market. Moreover, The IGR-Growth Matrix analysis given in the report brings an insight into the investment areas that existing or new market players can consider. The report provides insights into the market using analytical tools such as Porter's five forces analysis and DRO analysis of industrial steam turbines market. Moreover, the study highlights current market trends and provides forecast from 2018-2024. We also have highlighted future trends in the market that will affect the demand during the forecast period. Moreover, the competitive analysis given in each regional market brings an insight into the market share of the leading players.